In the dedicated team organization type, there is a different unit (like a department) which is responsible for the development of the projects within the organization. The team members are usually chosen from the other departments and they report to the project manager until the end of the project. After the completion of the project, the personnel will return back to their original departments. A sample scheme is shown in the following. 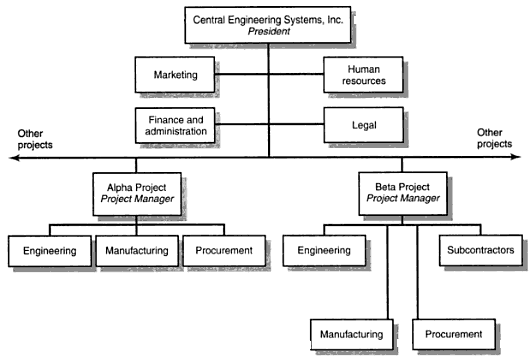 In the second type of organization (project organization), there is a project based structure inside the company. If most of the business of the company is based on new projects, like software implementation of software companies (they install new softwares to the organizations that require new softwares), the best structure will be a project organization. This means that one project will be followed by another project. Therefore, the staff who is working under a project manager will be working for another project in the future. The staff will not return to his original location after the completion of the project unlike the dedicated team project organization. 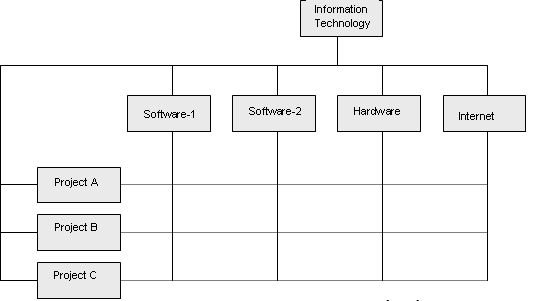 The last and the most recent type of organization is known as matrix organization. Matrix organization is a type of organization in which people with similar skills are pooled for work assignments. For example, all IT staff may be working in one IT department and report to an IT manager, but these same IT staff may be assigned to different projects and report to a project manager while working on that project. Therefore, each IT staff may have to work under several managers to get their job done. The example of this shown in the following figure. 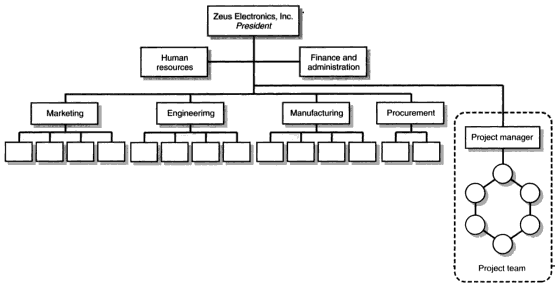 Samuel C.Certo, Modern Management, US, Prentice Hall, 2000, p. 7. Clifford F. Gray, Erik W. Larson, Project Management: The Managerial Process, US, McGraw Hill Professional, 2002, p.59. Hayri Ülgen, İşletmelerde Organizasyon İlkeleri ve Uygulaması, Istanbul, Istanbul University Business Administration Faculty, 1989, p. 81-82.